Setting: A handful of young men, my daughter and I, some pizza, wine and a good conversation. Now it is my turn to recommend this movie to you. Again, it is not an easy to movie to watch. Endure the hell of the first part (it is essential to understand the redemptive story) and have some Kleenex ready for the second half. It is powerful. 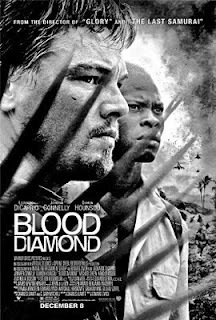 You can read a more extensive review of Blood Diamond at The Film Dissectors (know that you’ll find some spoilers though). Grateful for the Father’s love. This entry was posted in Daily Life, Family Table, Reviews, Weekends by Becky Pliego. Bookmark the permalink. Amy, it is definitely a movie for young adults. It is very crude and violent. What age range is appropriate for this movie do you think Becky? Always looking for a movie to share with my children. Thanks for your recommendation, Becky! 🙂 Pray you and your family are well. One of my daughter's and my favourite movies. I remember watching this with Ink. Not easy to do at all, but it is a powerful story. Wishing I could spy for even a minute on that wonderful setting of yours, Becky. Very much love to you!